Denver Broncos offseason positional review discussing what the team has based off of 2015 production of players on the team. We'll review stats, eye-test opinion, Contract situation, and depth on the Denver Bronco team as we prepare for the start of free agency and the NFL draft. I'm breaking down our team to look at what we have in the cupboard for this offseason. In doing so, I've gathered a bunch of data from www.nflgsis.com and www.profootballfocus.com to give us some stats to look at as we evaluate what our players did in the 2015 regular season. Also, www.overthecap.com Contract Info will be embedded when available. I'll add to that a synopsis of each player including their contract situation. Hopefully this helps Broncos Country here at MHR be better educated on the state of the team. Next up are the big playa's at Defensive End for the Broncos. Both positions are integral to what we do as a defense under Wade Phillips. In our scheme, they mostly attack a gap in order to either break up a run coming to their side or apply pressure to the QB in order to cause a sack. We've been blessed with a bucket load of extreme talent for 3 - 4 DEs and it showed in 2015. Defensive Ends in the 3 - 4 typically have more of a "power" pass rush versus a raw "speed" pass rush like you want from a DE in the 4 - 3. Yes, you always want speed, but because these guys take on the guards a lot and get combo'd at times, they have to be able to not get moved around by the bigger but slower interior offensive linemen. Both our starters are at least "very good" at everything based off what I saw last year. Scheme-wise you typically like a better run defender on the defense's left (Derek Wolfe) and a better pass rusher on the defense's right. The way our defensive coaches and scheme works, they keep guys trained up and ready to plug in all over the line. The only other wrinkle here to point out is that most of the time when we are in nickel, these ends are the interior linemen (think a 4 - 3 front...Miller - Wolfe - Jackson - Ware). 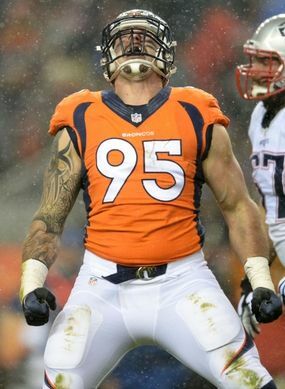 Derek Wolfe came into his contract year guns blazing. After spending 4 weeks on suspension for PEDs, Wolfe hit the ground running and really made an impact statement as to how good of a player he is with the other 11 weeks of the regular season and our most excellent playoff run. I really liked the motor I saw from Wolfe ever since he's joined the team. Now that he has the seasoning, power, and technique, he's turned into a nightmare for opposing offenses to deal with. The past few years, he's been known to be a supremely sound run defender, but left much to be desired in the pass rush department. That has changed this year. He's not a pass rushing specialist of Jackson's quality, but he sure as heck is better than most strong side 3-4 DEs playing in the NFL today. The big thing to me that I'm seeing from him on the field is burst. He's always had great power. He's always been able to shove some poor fool back into the pocket. The problem is it was typically a gradual thing that took time to develop. This year I'm seeing him explode more often and get himself in to positions where his blocker is in terrible position to slow him down. Against the run, this guy is a one man relentless wrecking machine. Tape on him should be shown to guys in college on how to defend the run. The guy is so sound in footwoork, positioning, hand technique, and leverage. I'm not sure why 2012 - 2015 are on the table here, but the deal he signed recently is reflected in the last four years listed here. He's got a very solid deal with the Broncos and is probably not even a consideration to be cut from the roster until the last year of the contract. Basically, barring injury, our strong side DE starter is set for 3 years. Malik Jackson is the kind of player every defensive coach wants to see somewhere on his front. He's powerful, has great burst, is quick, and does all of it while having solid size to back it up. Many of us point to the stats above and say, "Hey, Wolfe gets just as many sacks and hurries. Maybe this guy is hyped a little too much." Well yes, if you just look at the stats, that's probably the story. But as always with numbers, you need to dig deeper and without watching his play holistically you really do a disservice to the player. Go back and look at his historical stats. He always gets more than 10 hurries a year since he's been getting serious time as a starter. Sometimes he doesn't garner any kind of stat, but his push on the inside caused the QB to move away and make a bad play (sack, incomplete, etc). Wolfe and Jackson are kind of each other's yin and yang on the field. Malik is a better pass rusher and Wolfe is a better run defender. That being said, Jackson is by no means a liability in run defense. He gets big time TFL as well. This scheme really lets players like Malik with great talent take advantage and go make plays. If he somehow by a miracle returns to the Broncos for 2016 and beyond, I'll be amazed. I'll also give many thanks above for the blessing to this team. He's a great talent. 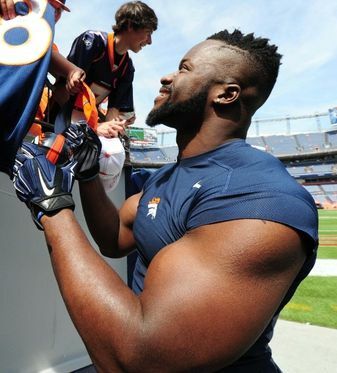 Okay...now you may notice one big reason Jackson isn't going to be a Bronco in 2016. He was drafted much later in the draft than Wolfe and as such his contract has been smaller in every way. The dude is going to want to get paid. 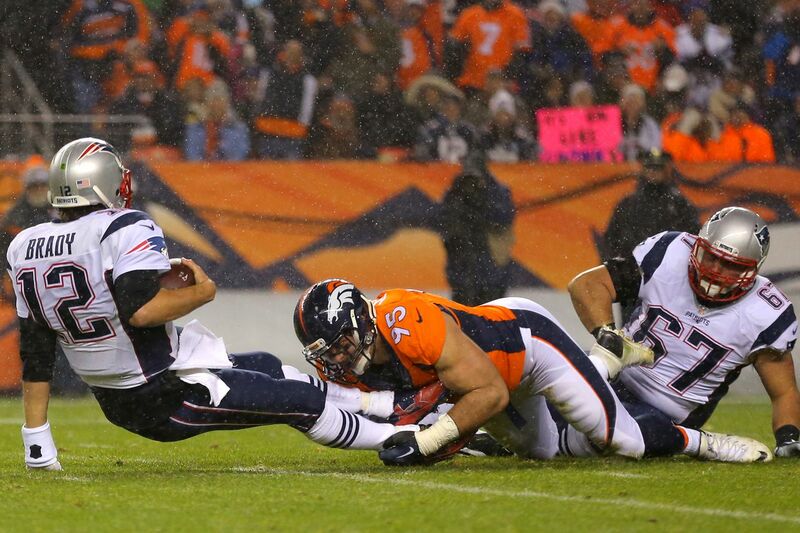 He's already given Denver their home-town discount in 4 years of his play at a VERY cheap investment rate. From his point of view, Denver has already gotten their return in spades on him. Now it is his turn. Antonio Smith a veteran player who knows all the moves and all the tricks. He was used rotationally in 2015, but his production was just what you want for a guy who you are only going to ask to take snaps here and there. With age creeping up on him, there's maybe a missing step here or a lack of endurance, but he had an effective enough 2015 season in my mind seeing about 33% of our defensive snaps. The big area of weakness for Smith is his run defense. When he did step in, he got moved around at times. Combo blocks were very effective against him. I'm not saying he is poor, just that was what I noticed as a weakness for him. This is what a short-term veteran contract looks like. Overall it was money well spent in my mind. That being said, you'd have to hope we can find younger depth that has upside to it. This is the time to look. If nothing pans out, I'm sure you could offer Smith similar numbers for another year if that's what the coaches felt like they needed for their rotation. Vance Walker was quietly our most valuable backup DE on the team in my mind. He's a player you could compare favorably to Derek Wolfe from a couple years back. He's very stout against the run. There's just not enough burst and speed for him to make a huge impact from a pass rushing perspective. He saw about 34% of the snaps in 2015 and was a lineman that you probably didn't notice very often. Sometimes with linemen not being noticed as much is a good thing. It means they are quietly going about handling their business and holding their ground. We've still got Walker under contract for 2016 and I see absolutely no reason not to hold onto him. He doesn't have the same look as Smith does of slowing down (historically speaking). The guy can get it done. He's a solid player who has a positive impact on the defense and a guy I trust to handle business if Wolfe were to have to sit out for any reason. Tease. That's what I think of about Kenny Anunike. I've loved his play every year in preseason. He's got so much upside and potential. But to date he seems to be smitten with the injury bug big time. How much of this year's season ending IR designation was serious and how much of it was the Broncos wisely letting a guy "heal up" at a position is up for debate. I think 2016 is going to be a big time year for Anunike. He's going to have every opportunity to make the team and have an impact as a starter if he can just keep himself healthy. He has the tools to get after the QB and stuff the run. It is a contract year for Anunike. It is probably also a career year for him. He needs to stay healthy and show everyone he has what it takes to be an NFL player. The positive for the team here is that his contract is very cheap. This is a low-risk contract with a possible high reward if he can put it all together. The big question here is what do we do at weak-side DE? We've discussed it ad nauseam here at MHR. Once the team either signs Jackson or lets him go we will have our hands on a big puzzle piece to our defensive unit this season. 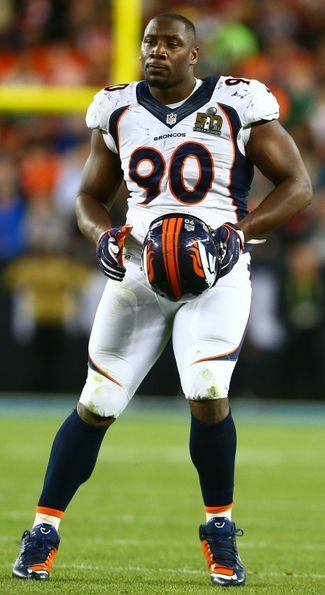 I honestly like where we are for 2016 even if Malik Jackson leaves. I'm bullish on Kenny Anunike taking strides this year and being a potential starter for the team. He is young, talented, and has one of the best defensive line coaches in the NFL getting him ready in Bill Kollar. Depth-wise I'm thinking we'll keep Walker and Anunike while looking for another guy for the roster in the draft or possibly with another veteran who wants a chance at a ring. Overall, this position is one that either needs money thrown at it in the way of signing Malik Jackson or is going to be one asking for a free agent, draft pick, or young player taking a big step forward in 2016. How would you grade our Defensive End situation?